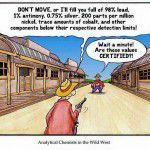 Don’t move, or I’ll fill you full of 98% lead, 1% antimony, 0.75% silver, 200 parts per million nickel, trace amounts of cobalt, and other components below their respective detection limits! Wait a minute! Are those values certified?! Bullets are typically made of lead with various other trace metallic substances and alloys. The second cowboy is referring to Certified Reference Materials (CRMs), which are measurement standards used for measurement analytics. What Do You Call A Tooth In A Glass Of Water? 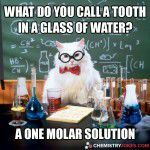 Molars are a unit of measurement in chemistry, which refers to the number of moles per liter of a solution (concentration molarity). Another definition for molar is that of a mammalian tooth. 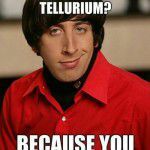 Hey Girl, Are You Made Of Copper And Tellurium? The periodic symbol for copper is Cu and the symbol for tellurium is Te, hence “cute”. 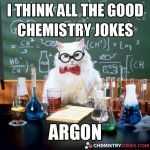 Chemistry Tshirts for sale. All sizes including Mens, Womens, Childrens and Chemists.